The color intensities was determined of Maillard reaction products (MRPs) prepared by heating each of five sugars (maltose, fructose, glucose, arabinose, and xylose) with each of 12 amino acids (aspartic acid, glutamic acid, alanine, leucine, isoleucine, valine, proline, serine, cysteine, phenylalanine, arginine, and lysine). The remaining percentages of glucose and rate of change of color intensity due to the addition of a metal ion and NaCl were monitored for nine MRPs that had been formed between glucose and each of nine amino acids (aspartic acid, glutamic acid, alanine, valine, serine, cysteine, phenylalanine, arginine, and lysine). Model MRPs were prepared in a block heater at 100°C for 1–12 h with the pH value controlled at 6.5. The resulting color intensity of each MRPs formed from the basic amino acids was greater due to the higher reactivity than those from the acidic amino acids. 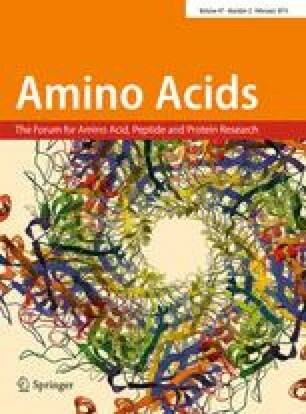 The remaining percentage of glucose in each MRPs from the basic amino acids was lower than those from the acidic amino acids. The MRPs from the nonpolar amino acids showed an intermediate color intensity and remaining percentages of glucose between those formed from the basic and acidic amino acids. Browning tended to be accelerated in the presence of metal ions, especially Fe2+ and Cu2+, although it was affected by the property of the amino acid and heating time as well as by the type of metal ion. On the other hand, browning was greatly inhibited by a high concentration of NaCl.